As Lila progresses from being a toddler to being a pre-preschooler, her vocabulary has exploded. She uses sentences and words we didn’t even realize she knew. For instance, tonight she broke the head off of her Honey Bunny cracker and became upset when we couldn’t help her “reattach” it. It took us about 5 minutes to figure out what she was saying because I expected “blue cat” to be more likely than “reattach.” Her long sentences amaze us as well as she tells us stories about her day – like “My mommy bought me sunscreen so I can go outside.” I don’t know why but I assumed potty training would come before complete sentences, so I am constantly amazed by the things she says everyday. As all toddler/pre-preschoolers do, Lila also repeats things. A lot. Sometimes it is a story – like the time she tripped over Obi on the playground at school or that Daddy’s phone was broken so he had to buy a new phone (this is told every time she sees A’s phone), but other times it is just a phrase. One such phrase as become her catch phrase. Ask Lila almost anything and you are very likely to hear the response “That’s so silly.” (This includes the time she tripped over Obi on the playground.) She delivers it in a delightfully ridiculous voice and has an adorable scrunched up face to match. While “that’s so silly” is not her most impressive sentence or word usage to date, it is probably the one we enjoy hearing the most. It makes her seem like a toddler star on some new Disney Channel show, complete with laugh track and twin Lila’s playing the role of the adorable younger sister who delivers her signature line on cue as the other characters encounter ridiculous shenanigans each week. That’s so silly. PS – Don’t be silly and miss supporting LC’s Team in this weekend’s March for Babies! Follow the link and help us reach our goal before we step off on Saturday. This is our third walk with our very healthy (and silly) preemie – help us celebrate! As Easy As. . .
As the weather continues to improve, we’ve been trying to have Lila play outside more on the weekends. Not that we ever kept her cooped up inside, but we try to make sure she gets at least 15 minutes of good outside time in each day. (During the week she goes outside for an hour a day with her day care class – rain or shine. Seattle kids are tough.) We’ve realized that like beagles, toddlers do better with a chance to expend their energy. Expecting either a beagle or a toddler to sit nicely at, or by, the dinner table when they have not had a chance to get some fresh air that day is just a lesson in frustration. In an effort to get outside, we bought Lila a new bike. It’s still a little big on her, but she loves it and is having a great time going fast on it. I think she’s pretty cute in her helmet too. We’re still working on how to pedal – we spend a lot of time saying, “push with this foot! Now the other! No, not yet, keep pushing with the first and then the second.” This is probably not the best way to teach such a thing to a toddler, but she is enjoying herself anyway. I am sure the skill will develop with time (quicker than we expect, most likely) and then it will be just like riding a bike. If a Bear Turns Two. . .
and a mommyblogger doesn’t blog about it, does it really happen? I had fully intended to have a party for her and to allow our friends to meet Lucy, but in the end I threw in the towel. I just couldn’t get the house (and myself) together enough to have people over. So a quiet birthday celebration was had. There were pancakes in the morning, cookies at day care with her friends and then cake (with purple sprinkles) in the evening. In true new mom style, not only did I not throw a party, but I burnt the angel food cake I made for her. Lucky for both of us, Lila just ate the Cool Whip off the top of the cake and didn’t seem to mind. Maybe one day I’ll get myself together enough to throw Lila a party complete with buntings and themed snacks with printed labels and party favors and Elmo cupcakes – but for now, for now I’m lucky to have such a fantastic little girl who smiles so brightly. For what it’s worth, I’ve been writing blog posts in my head for the last week. It’s just the getting it down in a post online that hasn’t happened. In light of those several posts floating around in my head, here’s one that tries to hit all the highlights – and the lowlights. – Seeing LC be such a caring big sister. Sure she may be overenthusiastic sometimes. She may squeeze a little too tight or not understand that Lucy can’t hold a block or a stuffed animal, but she loves her little sister. She loves holding her and patting her back. It is amazing to see what a caring little being she is. – Time at home as a family. Even though Lucy wasn’t there for all of it, we had a nice two week holiday break as a family and it was really really nice. Especially since A and I decided that we could eat fast food for lunch almost everyday. – Lucy is a pretty easy baby. I know, I shouldn’t be saying anything. I’m sure this will curse me tonight. But so far? Not too bad. – A went back to work after only the two holiday weeks off. Since Lucy was late, she was only ten days old when he returned to work. Oh and work is a week long business trip. I’m bitter that so many of my friends are able to have their husbands home for extended periods of time after the birth of a baby. I’m lonely and balancing two kids on my own today and tomorrow. It’s all very silly – I also have a friend whose husband was deployed when their fourth child was born, so clearly I have little to complain about. But still, I miss A. I wish he could have stayed home with us longer to enjoy our new family. – Postpartum. I’m getting better. It no longer takes 10 minutes to go through my whole bathroom routine. I’m down to one prescription ibuprofen a day. I can get in and out of the car without groaning in pain. But up until this weekend, I felt pretty lousy and I was just ready to feel like myself. Clearly birthing a 9lb baby takes a toll on one’s body, but I just wish I had bounced back a little faster. And I have stretch marks. Blergh. – Coffee. I have yet to finish a cup of coffee. I even got a latte today, didn’t finish it and put it in the fridge in the hopes I can revive it tomorrow morning. – Diapers. We’re trying to find the right size/combination of prefolds/covers for Lucy to be cloth diapered. So we’ve been using disposables until the new cloth arrives. And wow, do newborns go through a kabillion diapers a day. I swear we just bought a giant thing of diapers and tonight I noticed there were only 3 downstairs to make it through the night. This may make it seem like cloth wouldn’t be the best option but so much easier really. Oh and cheaper. And when I realize I have 3 left, I just do laundry, instead of trying to decide if I need to pack two kids (who are already sleeping) into the car and make a run to Safeway. – Mommy guilt. Bringing a new baby home when you already have one at home creates many different feelings than just bringing home your first baby. In the hospital I couldn’t wait to get home and see LC, I missed her so much. I’ve cried so much as I watch LC struggle to figure out her new place in the family and seen the increased mommy anxiety she has. We made the decision to try to keep her routine the same as much as possible, so she continues to go to day care. I know being there is more fun than watching Momma feed her little sister every 2-3 hours, but being home while she’s off at day care really breaks my heart. Making my two girls happy has such a different meaning for each of them right now, and LC’s happiness is much more emotionally than physically based at this point, so it is more difficult to watch her unhappiness. I know it is all part of our family growing pains, but it is definitely been hard. Overall, we’re doing just fine. We’re busy, a little tired, trying to keep up with household chores and get some sleep, but we’re getting by. Eleven days down – ten since we came home – and everyone is still alive. I’ve only threatened to sell the pets 8 or so times. I’ve cried more than a few times, especially when leaving LC at day care and I miss A more than I really should since he is only gone until Friday. But we’ll make it through barking dogs, hormonal crying jags and yet another CES just fine and I look forward to the highlights in the weeks to come. With a husband who works for a very large retailer, Black Fridays have been a hectic time since arriving in the Emerald City. While the Friday after Thanksgiving is almost a found day for me, it is one of deadlines and stress for A. This year, while I was still excited for the time off and the extra time with LC, I was also very aware that I would have one very active toddler to entertain as a very pregnant mom. Our original plan was to drop A off at work, park the car and take the bus into downtown to watch the Seattle Macy’s Holiday Parade. While I know LC would have enjoyed the parade, the downpour we encountered on the way to A’s office required a change of plans. I just didn’t think making both of us wet and cold would help the day start off successfully. So we parked the car and headed to Starbucks. It may seem like a ridiculous thing to do with a toddler, but LC had a great time. We ate pumpkin bread, sat in big chairs and watched as purple buses rode by the big windows. It is not every day LC and I get to just hang out and people watch, so it was a pretty special time. After finishing up our time at the coffee shop, we decided to check out the REI flagship store to look for a new hat for LC. REI has a pretty fantastic indoor “treehouse” so our plans of shopping were soon replaced with an hour of climbing and playing at the treehouse. It was wonderful to watch LC climb and play – she did so independently of me, but always returned to see that I was still there. While still a cautious child, she has become so much more outgoing in the recent months and it is so much fun to watch her now climb and run with other children (but still like to come back for momma hugs). It took some decent toddler wrangling to convince her we had to leave, forget trying on new hats. I grabbed a fuzzy purple one and hoped that LC would grow to love it. All of this activity earned Momma a really great after lunch nap for both of us. By the time LC woke up, A called and said he could come work from home. Early release on Black Friday was pretty special. LC thought so too since it meant she could “work” side by side with Daddy. Chasing after a toddler on your own when you are 36 and a half weeks pregnant can be tough, but it is days like this Black Friday that I will always treasure as my time as momma to only LC dwindles. She’s an incredibly special little girl, even when she is throwing temper tantrums in the middle of large outdoor supply stores. We made the command decision to not take LC trick or treating this year. We don’t get home from work until after 6 and we start bedtime routine slightly after 7, so there is little wiggle room in there. Add to that these hours are really the fabled “witching” hour for LC and it just seemed liked a bad idea to drag her house to house, forcing her to interact with strangers, to bring home candy that we weren’t going to let her eat anyway. A’s office does a trick or treat event each year, so we decided we’d just hit that up in the afternoon. She could get dressed up and we could show her off and take photos, without interrupting the evening routine too much. LC had a fantastic time, though she soon realized that the real appeal of Dada’s office is not the candy or the nice people who think your kitty cat costume is too cute. It is the fact that Dada’s office allows dogs. LC literally raced through the halls looking for “more dog-goo”. She rejected candy and the advances of strangers, but was willing to pet any dog she came across. Another thrill was that almost every dog was in costume, though I think the Boston Terrier dressed as a velociraptor may have confused LC a bit. Here’s LC as a kitty cat, hanging with her BFF Cal. ** I’m not saying taking your kid trick or treating will turn them into a cavity ridden obese child. I’m just saying if LC is going to come out of Halloween being really into something, it is desirable that it be petting dogs and not eating lots o’candy. At my regular OB appointment yesterday I mentioned that having attended the Seahawks game on Sunday may have been overdoing it and I was feeling the consequences. (I didn’t mention that the one-two punch of the Nationals loss on Friday followed by the Patriots loss on Sunday had done some serious emotional damage to me as well. #bullmoosecurse) My doctor said I needed to slow down and focus on work and growing a baby. You can see where there might be some fault in her logic – one adorable 20 month old named LC. I went to bed last night, knowing I needed to stop doing more than what was necessary and ready to get up and face the rest of the week. By noon today, I was miserable. Day care drop off had gone poorly and I ended up barely making it out of the room, leaving LC sobbing for Momma, before I too began to cry, feeling awful about the latest phase of separation anxiety. I went to have a delicious biscuit sandwich at Serious Biscuit to try to take some of the edge off, only to have them screw up my biscuit order. Two meetings later and my back was killing me and it was only 1pm. By bedtime tonight, I was tired and just willing LC to go to sleep. All she wanted to do was cuddle, which just wasn’t compatible with how uncomfortable I was feeling. I kept trying to explain to her she could either sit still or go to bed, but she’s 20 months old and of course doesn’t understand. After cuddling and rocking for a while, I put her, asleep, into her crib. And felt horrific. My little toddler daughter just wanted to snuggle before bed and I was putting limits and restrictions on her, telling her I didn’t want to cuddle if she was going to fidget. 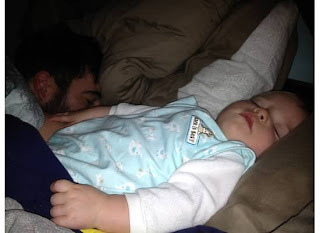 Its not that I didn’t want to cuddle, I just could not physically take the toddler knees in my gut much longer. But it made me feel like such a terrible mother. I just didn’t have that much to give tonight and by bedtime I was on fumes. I worry that in the next 9 weeks I will have less and less to give – to LC, to my job, to A, to the house. I hate using being pregnant as an excuse – there are things that need to be done over the next 9 weeks and I just can’t decide to bow out. Some of them are things like cuddling my daughter before she goes to bed, others are ensuring contracts get reviewed and signed or making sure that the milk delivery order gets in on time each week. But I also need to ensure that I am being fair to the littlest of our family, BE2 and that there is something left for her to give each day. I have no idea how to find the balance and I know there will be times when LC needs something extra or I have to put an extra hour in at night to finish up something for work, but in order to make it through the next (hopefully) 9 weeks, I know I need to reexamine how my energy is allotted and hope that is all balances out in the end. Tuesday evening went well enough until LC refused to go to bed. I tried to ride it out – sometimes she just fusses a bit before putting herself to sleep. I decided to jump in the shower and take 5 minutes to see if she would calm down without intervention. No such luck. I also tried to talk to her through the baby monitor, which is advertised as being able to soothe babies without having to enter the room. For the record, this most definitely made things worse. Perhaps the only thing worse than being in a dark room by yourself wanting your momma, is being in a dark room by yourself wanting momma and a disembodied voice telling you to just go to sleep. A little cuddling and soothing and explaining once again why Dada was not there, she went down. An hour after we started. I headed to bed, where I made the mistake of not listening to my body which was exhausted at 8:45 and stayed up until 10-ish. I had just rolled over, with the pregnancy pillow finally in a comfortable position, when A called to let me know he was safely in NY. In the middle of our chat, B-Cat let out a horrific yell from the bathroom – I ran in to find that she was fighting with a cat (I hope it was a cat) through the open bathroom window. (There was a screen between them.) All this cat ruckus woke the dog who decided to run upstairs and request to be let outside to explore. (Cal never wakes up after going to bed in the evening. He has the most dependable bedtime routine there is, so this getting up was unusual.) Gathering everyone back in bed, I went to sleep, the sweet sounds of House Hunters on the tv to help lull me to sleep. And that is exactly where I was at 2am when the baby monitor lit up and LC started to wail. I waited 10 seconds to see if it would pass, but alas, no such luck. Rolling over, I picked up the video monitor to see if (fingers crossed) she was lying down and crying, in which case she was much more likely to cry it out and go back to sleep in a few, or if she was standing up. Of course, she was up. Up to her room I went, where a complicated system of backrubs and cuddles commenced. After she had been asleep on my chest for 15 minutes, I attempted to place her back in the crib. As soon as she sensed that her cheek was now on the cool sheets of her crib and not on Momma’s chest, she catapulted into a seated position and started to wail again. Complicated system restarted. As I attempted to transfer her to the crib again, I heard a familiar sound on the stairs. Yes, Cal was up again – and wanted to go out. And he wanted me to know this. Cold sheets combined with doggie whines meant LC was not sleeping again. I gathered everyone up and we all trudged into my room. “Dog-goo? Dada?” LC narrated as I tried to arrange everyone in bed, as well as building a pillow wall on A’s side of the bed so that LC could sleep without falling out of the bed. After all, she was happy sleeping on my chest, she would surely be happy sleeping next to me in bed. And she was. FORTY FIVE MINUTES LATER. She decided a bed filled with Meow (what she calls B-Cat), Dog-goo, Momma and at least a thought of Dada was the perfect place for a slumber party. She didn’t want to chat about boys, instead we chatted a great deal about Meow, milk and apples. Around 4am, she quieted down and fell asleep. LC and I rallied, discovered I’d left the diaper sprayer in the upstairs bathroom on (hence the leak to the master bath), mopped up the water as best I could, got everyone dressed and fed and we were out the door. As I stood in the Starbucks line waiting for my ½ caff venti skinny caramel macchiato (and wondering just how much I would stunt the growth of my unborn child if I went all caff. . . ) I checked my email to discover my 9am meeting cancelled. Murphy’s Law indeed.